When Hurricane Harvey slammed into Houston last fall, Texas Children’s Hospital was ready to provide care to the children and families in need thanks in part to the Christie Phoenix system installed in Mission Control. 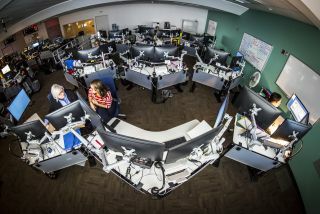 Opened in April 2017, Mission Control is a unified operation center allowing for real-time communication and decision making for staff across the system to respond and get ahead of potential impacts. The facility has helped Texas Children’s reduce transport response times, improve the patient-acceptance process, optimize system communication—and deal with crises. The SSR team has been the technology consultant for Texas Children’s for several years and with the new section being built, knew there was going to be a large audiovisual component. Along with Texas Children’s IS (Information Services) Department, SSR researched various companies and selected the Christie Phoenix information management system. Diversified, number two on SCN's Top 50 list, was selected for the purchase and installation of the Christie Digital Phoenix system. “We wanted something highly reliable and flexible for growth if we want to renovate the other side of the space. We wanted something with a network-based distributed architecture and something with redundancy and controller failover because it’s a 24/7 operation,” said Graves. “As we went down the check boxes of what they needed, Christie won in all of those." Graves said he and his team were impressed with Christie’s Professional Services and the overall customer service provided by Christie. During its first month of operation, the transfer team reduced its time from dispatch to pick-up by 20 minutes. Cutting down the response time has led to a significant increase in transports and faster medical treatment. With the Christie Phoenix system in place at Mission Control, new doors of opportunity for Texas Children’s continue to open up when it comes to speed and efficiency—and, where every minute counts when it comes to health care—saving lives.